Let your kids take their tastebuds on a delicious adventure at the Royal Botanic Garden Sydney’s award-winning Tomato Festival Sydney on Saturday 17 and Sunday 18 February. Tickets are on sale now for the Festival’s hands-on kids’ pizza making event, Pizza Plants . Activities include a treasure hunt to find pizza ingredients growing in the garden, planting yummy Mediterranean herbs to take home and making a munchalicious mini-pizza to eat. 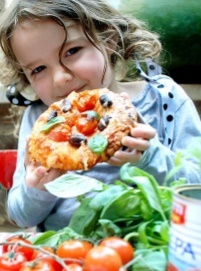 “Pizza Plants is a fun and hands-on way for kids to learn about where their food comes from and enjoy and experience of garden to plate.” said Wendy Symonds, Event Producer of the Tomato Festival Sydney. While their children are having fun making pizza , parents can enjoy the rest of the tomato-inspired festivities on offer in the Festival Village while looking out across the phenomenal views of Sydney Harbour and the Opera House. Bring the whole family for an inspiring harbourside food festival with something for everyone.